Think Your Pension Is Safe? Think Again! Pension funds take money set aside for retirement and invest that money into safe securities. The goal is to grow that money so there is enough capital to pay retirees down the road. These pensions must protect their capital, because losing money for their retirees would be disastrous. But they also must grow their investments. Otherwise, there won’t be enough money to pay employees when they retire. In the past, these funds could buy safe investments like Treasury bonds or highly rated corporate bonds. The yields on these safe securities would help the pension funds grow their accounts just enough to be able to pay retirees. But all of that changed since the Fed has lowered interest rates and kept them near zero for the better part of a decade. Yes, the Fed raised rates last month. But they’re still hovering just above zero. Continue to invest in “safe” bonds. This choice guarantees that pension funds will not generate enough money to pay retirees. So this option is not a good one. Buy “riskier” investments. This choice may give pension funds higher returns, which will allow them to pay retirees. But this choice is also not a good one, because riskier investments could backfire, causing pension funds to lose money! By the way, this wasn’t an accident. It’s been an actual, purposeful war by the Fed. The Fed doesn’t want you to save, and it doesn’t want these pension funds to invest in safe bonds. Instead, the Fed wants you — and these pension fund managers — to invest in riskier opportunities. That’s because the Fed thinks that directing money into these riskier opportunities will lead to better growth opportunities for the economy. That should make it easier for U.S. corporations to meet their obligations to retirees. And hopefully, retirees can sleep better at night, with confidence that their pension checks will continue to arrive on schedule. While a $116 billion advance is certainly good news, U.S. corporations are still left with a $414 billion shortfall. That’s money that corporations will need to add to their pension programs if they plan to meet their obligations to retirees. It’s all a matter of perspective, really… You can choose to look at the glass as about 20% full or 80% still empty. Oh, and keep in mind that while corporate pensions have swelled to the tune of $116 billion, these funds still have a deficit $10 billion worse than it was at the beginning of the year. Statisticians can typically spin data to imply whatever they want to communicate. And in the case of pension funds, the truth is a bit less attractive than the $116 billion figure suggests. You see, pension funds need to estimate how much cash they will have in the future, based on their current capital and an expected rate of return. The reported $116 billion advance was largely due to higher expectations for future investment returns. Basically, the pension funds are looking at higher interest rates and assuming that they’ll be able to grow their investments faster. And that should help them have more cash for retirees. According to their damned lies (oops, I mean according to their “statistics”), these funds should be able to grow their investments more quickly in the years ahead. But can we really look at the recent market advance, and the higher interest rates, and say that the future will now be $116 billion better? Possibly, but I wouldn’t bet on it. Especially when investor greed is high and U.S. stocks are very expensive compared with historical norms. Keep in mind the California Public Employees’ Retirement System (CalPERS) is actually lowering their long-term investment return expectations, as I mentioned above. So if you see the “encouraging” news that pension plans made up $116 billion, please take those statics with a healthy dose of cynicism. If you’re not counting on a public or a corporate pension plan to fund your retirement, you might think you’re in the clear. But the $414 billion pension shortfall may become a much bigger problem, affecting those who don’t even have a pension. First, there is the bailout/tax issue. You can be sure that the federal government isn’t going to sit by and let corporate pension funds fail without stepping in and bailing them out. That doesn’t mean that retirees will be made whole. Who knows how the situation could pan out — but retirees could be forced to accept smaller monthly payments or reduced lump-sum payouts. But it does mean that the U.S. government could be saddled with huge expenses. And that means higher taxes for you and me, and possibly another round of financial crisis in the U.S.
Another reason you should be concerned is the effect this shortfall could have on the U.S. stock market. The pension fund shortfall affects big companies that trade on the U.S. stock exchanges. If projections for future returns wind up being too optimistic (which I believe they will), and as these corporations are forced to put more cash into their pension funds, stock prices will likely drop. A fall in the stock market (due to lower profits as companies fund their pension plans) could hurt your retirement — even if you’re not counting on a pension check! Whether you’re saving for retirement in the future or you’ve already crossed the retirement threshold, you need to take control of your retirement funds. It no longer makes sense to rely on your corporate pension, Social Security or any other “promised” retirement plan. Thankfully, there are still some great options available to you. These options can mean the difference between enjoying your retirement years doing the things you enjoy with the ones you love and scrambling to make ends meet week in and week out. I’ve made it my mission to help retirees (and future retirees) by bringing my readers the best income opportunities that I can find and showing them exactly how to take advantage of these opportunities. 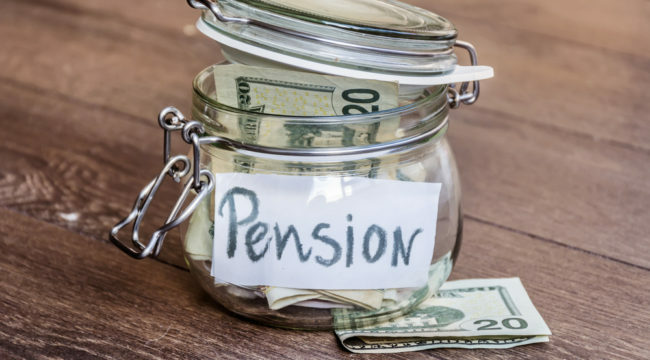 You don’t want to leave your retirement up to chance or up to the pension bureaucrats who are slowly mismanaging U.S. corporate pension funds into oblivion.